Update: the WP Engine PHP 7 results are in! Download the updated report and read the results below! When it comes to hosting your WordPress website, you want it to be fast-loading. And when it comes to hosting in general, we all know you get what you pay for. Right? Right. Still, there must be some WordPress hosts who are faster than the rest – for the same cost – or better yet: even less expensive… Right? Right. Here, we’ll look specifically at a handpicked selection of popular managed WordPress hosting providers. You’ll find out whether Flywheel, WP Engine, Media Temple, Pressable, StudioPress Sites or even Bluehost is capable of delivering the fastest WordPress hosting on the planet. And who knows? (soon you will) Maybe it is even possible to get Ferrari-fast (or even the fastest) WordPress hosting – on a budget? Read on friend! 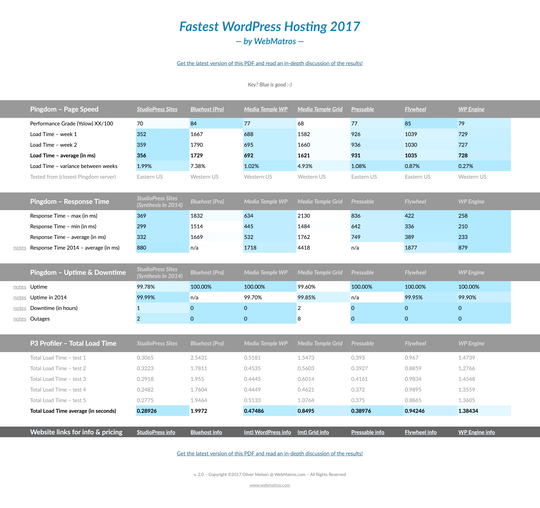 This post is the significantly expanded 2017 update of a popular WordPress hosting speed comparison I did, almost three years ago. That legacy presents us with a unique opportunity, to compare those original results, with these fresh 2017 test results! Has performance changed, since I did the first version of this speed-comparison? Do the winners and losers still rank like they did back then? Or has everything changed dramatically in the meantime? Did Media Temple step up their game? Did WP Engine lessen their industry-leading high standards? 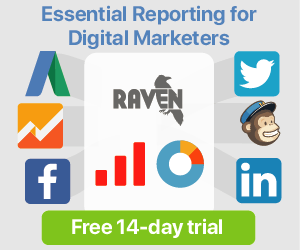 Did Rainmaker Digital (formerly Copyblogger) launch a discount-version of Synthesis with StudioPress Sites? Does Flywheel perform better or worse now, compared to 3 years ago? In this update, I’ve also expanded the comparison to include two “new” hosts: Bluehost and Pressable, and I’ve replaced Synthesis with StudioPress Sites. More on that below. I like Flywheel a lot. They’re fresh! Fresh like a strawberry popsicle on a hot summer day. I’ve previously reviewed WP Engine here. I’ve also reviewed Media Temple’managed WordPress hosting here. Read that one for my low-down on Media Temple’s managed WordPress hosting service. I do generally recommend their Grid (see below) over their managed WordPress hosting. The latter is faster than the Grid, but my overall experience has been best on the Grid, on which I’ve hosted websites for around 10 years now. Even though Media Temple’s Grid is shared hosting – unlike Media Temple’s managed WordPress hosting – I’ve included the Grid in this comparison, to see how it performs relative to Media Temple’s slightly pricier managed WordPress hosting option. I also wanted to see how Media Temple’s cost-friendly Grid fares, compared to more expensive hosting competitors like Flywheel, WP Engine, and StudioPress Sites. The Grid includes 100 sites for $20 a month – quite an amazing deal! I’ve also reviewed Media Temple’s Grid in-depth here. Synthesis did extremely well in the original speed-comparison (albeit at a slightly higher price point than its competitors WP Engine, Flywheel and Media Temple) so I’ve been excited to find out how StudioPress Sites perform compared to Synthesis. Did Rainmaker Digital compromise on the quality and blistering speed of Synthesis? The answer to that is about to be revealed;) Will Brian Clark remain undefeated? Pressable is a newcomer in this test. I’ve been wanting to test Pressable for a long time. Their pricing is enticing, to say the least! Far below most competing managed WordPress hosting services like WP Engine, Flywheel, Media Temple and StudioPress Sites. That said, Pressable still isn’t “dirt cheap” a la discount hosting services like GoDaddy, Site5, and Bluehost. Yet, the question remains: how well does Pressable perform? Indeed my friend; I did say Bluehost. To throw a joker – or underdog if you will – into the mix, I included Bluehost, even though I’ve always perceived Bluehost to be a discount host with all the connotations that follow. I’m always open to be pleasantly surprised, so here’s a “cheers and good luck” from me to Bluehost. May the best host win this epic Gladiator-battle of giants! Anyway, to give Bluehost the best odds at competing fairly against industry heavyweights like WP Engine, Flywheel, and Media Temple: I picked Bluehost’s Pro plan, boasting a “high performance server” at “only $13.95 per month – normally $23.99” (paid annually). My thinking was something along the lines of “paying a little extra at Bluehost may be the key that unlocks the kingdom to brutally fast WordPress hosting – still at a low cost. Like tipping the waiter at your local restaurant a little extra – and receiving superior service in return. On the other hand, a discount host is a discount host, no matter what. Ordering the most expensive meal at a cheap restaurant usually won’t mean that a great culinary experience is in the cards. You still just ordered “the most exquisite discount food available”. Same could turn out true, with Bluehost Pro. A bit less bad… but still bad. But that’s all just my brain churning. Which scenario will play out in the real world? Can Bluehost Pro excite and delight our website-owner tastebuds? they’re some of the most popular hosts, so testing them will help as many readers as possible. for practical reasons, I had to focus the test’s scope to a manageable handful of hosts. these are the ones that I myself would be most interested in, if I was looking for managed WordPress hosting for my own online business needs. I have a major dislike for ugly, hideous hosting websites. My audience is mostly “normal” business owners, with a good sense of visual aesthetics and a refined taste for good design. They’re not sysadmins. 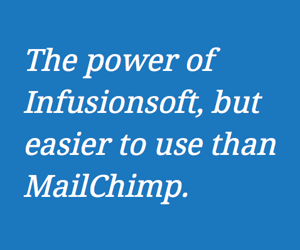 That’s why I favor designer-friendly hosts like Flywheel, Media Temple and WP Engine. I simply won’t test some obscure new host who may be gone tomorrow – or has a messy website that may reflect the attention and care they’ve put into their hosting control panel (i.e. it’ll likely be a horrible user experience). I didn’t have access to the old test page used for the original hosting speed comparison so I couldn’t reuse it – had to create a new one. So please note: the new results are not directly comparable with the old ones. I’ll get back to that in a moment and explain how you can contrast the old vs new test results, for even deeper insights. The purpose of the page isn’t to be beautiful, but meaningful for testing purposes. I wanted the page to utilize around 100 database queries – a fairly common amount, especially for WordPress sites running WooCommerce, WPML or other database-intense plugins. I activated all of Jetpack’s many modules, except for Automattic’s Photon image hosting CDN (content distribution network) as it would obviously interfere with the test results by serving the images from Automattic’s servers, rather than the tested host’s servers. For the theme I chose Altitude Pro from StudioPress. It’s a great theme – and its multi-section front page layout allowed me to “strain” the servers with a few more http-requests to load a handful background images too. Each test ran for 16 days. For your convenience, I’ve also included the most important test results from the original 2014 comparison in the spreadsheet. This is to help you get an idea of each host’s consistency, throughout the years. As noted above: you can not directly compare a specific host’s 2017 vs 2014 numbers. The tested pages differ vastly. The 2014 test page loaded 100 blog posts, to “put some pressure” on each host. ‌That’s why the response times were much higher across the board, back then. What you can do however, is look at the relative ranking of each host, within that year. Please take the reported uptime, downtime and outages with a grain of salt. A 16-day test is insufficient to properly validate a host’s uptime and downtime. Any host can experience downtime. That doesn’t mean they ever should be down, though. All hosts should strive for 100% uptime. So, despite the time frame, it’s still a highly relevant observation. Hosting is a mission critical piece of your website online business. Just as Navy SEAL snipers are expected to hit their target every time (one shot – one kill) you want your smoothie every morning – and your website to be up. Hooyah? Hooyah! Pingdom offers two metrics to measure website speed: Response Time and a Page Speed / Load Time metric. The latter ‌being the most reliable measure of how fast your website is, for your visitors. That said, Response Time holds value too. If we look at Response Time, WP Engine claimed the #1 spot, with a Response Time average of 233 ms. StudioPress Sites came in second, with a Response Time average of 332 ms. Hot on the heels of StudioPress Sites were Flywheel, with a solid 389 ms average. StudioPress Sites = incredibly fast WordPress hosting. They veritably dominate the Page Speed test, with a Load Time of just 356 ms. Media Temple’s competitively priced WordPress hosting conquered the #2 spot, with a Load Time of 692 ms. Still, it’s almost double the Load Time of StudioPress Sites. Anyway, breathing heavily down Media Temple’s neck, is WP Engine with a Load Time of 728 ms. However, the PHP 5.6 test was set up just before WP Engine sent me an email, notifying me they’re now offering PHP 7 (replacing PHP 5.6) promising huge performance gains. I wanted to complete the WP Engine test within the same time frame as the other hosts, so I let it complete. A new WP Engine test with PHP 7 will be shared here, in the coming week. the WP Engine PHP 7 results are in! Get them now! Will WP Engine beat the astounding speed of StudioPress Sites? 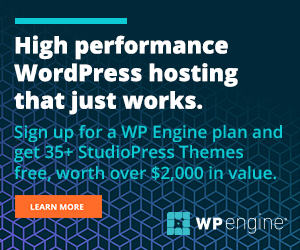 You may wonder why StudioPress Sites beat WP Engine in Page Speed – when WP Engine beat StudioPress Sites on Response Time? An oldie but goodie, P3 Profiler is a free WordPress plugin for testing your site and server performance. I’ve put it to use by running it 5 times on each host, and calculating the average Total Load Time – a metric that measures exactly that – including the load speed of the WordPress admin – making it an enlightening supplement to our Pingdom measurements. Since the WordPress admin can’t be cached, this test gives us a solid idea of the “rubber meets the road” server performance from each host. The P3 Profiler results are revealing! StudioPress Sites outperformed all competitors (even WP Engine) with its superior score of 0.28926 seconds. Two competitors (somewhat surprisingly, I must say) came close though: Pressable, at 0.38976 seconds and Media Temple’s WordPress hosting at 0.47486 seconds. 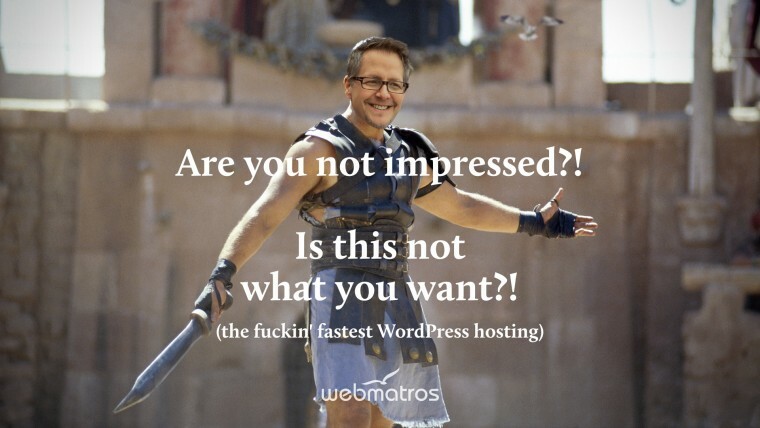 Let’s first ask: who delivered the fastest WordPress hosting in 2014? WP Engine and Synthesis, the latter in this test represented as StudioPress Sites as both are from the same provider: Rainmaker Digital / StudioPress. That translates as: StudioPress won this shoot-out, back in 2014 – and now again, in 2017. And even though WP Engine is a lot faster with PHP 7 than PHP 5.6, StudioPress is still fastest across the bloard, also in the P3 Profiler test. That means, we can hereby, by unanimous decision: declare StudioPress Sites the confirmed, un-dis-pu-ted WINNNNER of the 2017 Fastest WordPress Hosting World Heavyweight Championship! Venerable victory by StudioPress Sites. I’m deeply humbled. StudioPress Sites is a pretty badass, high-performance contender in the hosting arena. But ehm… we haven’t look much at pricing yet, have we? Now, you may want to pay what it costs for your website to be the absolute fastest. For you, pricing may not be a factor. You want the fastest WordPress hosting available, for your website. However, there may also be some of you, who want the fastest WordPress hosting – that you can afford. The fastest hosting – on a budget. Pressable impressed me a lot. Not only performance-wise, but in all aspects of the user experience. Their admin UI is clean and everything was smooth sailing. 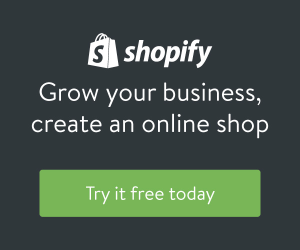 Writing this, $25 monthly will let you host 5 sites. That’s $5 per fast-loading site. A bargain. One thing you must be aware of though: Pressable doesn’t offer email hosting. So you’ll have to set up your email somewhere else, like G Suite (Google Apps) or wherever you please. But that’s true for all of the tested hosts, except Media Temple and Bluehost who do offer email as part of their hosting plans. Pressable even comes with a CDN at no extra cost! At Flywheel a CDN costs extra. Taking cost into account – the best speed-value for your money, overall, can be found at Pressable. Did any host fail miserably? Bluehost. Look at those numbers… All across the scoreboard, Bluehost lags behind. This is even on the Bluehost Pro plan that I paid extra for, to see Bluehost enter the cage, fit for fight. Bluehost is a dud. It’s utter, completely crap hosting. There, I said it. Bluehost… Pro… Haha. Pro. What a joke. A marketing gimmick at best. Media Temple’s Grid did a little better than Bluehost, and the admin UI is miles that of Bluehost whose hideous admin to me resembles the mess left behind by a 4 year old who’s been playing with Lego bricks on the floor. Dear Flywheel aren’t mentioned much above. Answer is: Flywheel didn’t excel or dominate as such. And they didn’t do poorly either. Still, I’m a huge fan of Flywheel. There is a smoothness to Flywheel that I can’t quite put my finder on. Their admin UI is the best of all the tested hosting providers here, and using the WordPress admin on a Flywheel hosted website simply feels sublimely smooth. I realize that may sound weird, woo woo or wishy-washy – nevertheless: there’s something to it. So much so in fact, that I’d strongly consider hosting my own stuff on Flywheel if needing another webhost. Why? To get that feelgood Flywheel feelin’ (could almost be the title of a late 1970s pop rock song by Journey, Boston or Asia). That’s all folks! Feel free to share your hosting experiences and thoughts on these results in the comments below! Also: please share this blog post with your network! I’ve put a LOT of work (research and testing) into the making of this managed WordPress hosting speed comparison. Please help me share it, so more people can benefit from it! Use the sharing buttons. Thank you! And thanks for reading it too:) You’re the reason I do this stuff. Thanks for this, it’s very helpful. Did you comment elsewhere on the support and services by each of these hosts? Like updates and backups, and anything else? Those would be factors in my decision about a host. In individual reviews, but I haven’t written such for them all, only a few of them. WP Engine has excellent support. Media Temple too (in my experience, though some have reported otherwise). Flywheel are good too. Backups are important. Although I haven’t experienced any issues with the backups from the above three, I recommend one also sets up a backup-mechanism oneself, using a WordPress plugin backing up to Dropbox, or (for the technically inclined) via a CRON job – a little script that runs automatically on the server, at a specified interval. You passed the Bluehost test. Bluehost is so awful on so many levels that it should be out of business. But it buys so many affiliate reviews who then lead so many poor newbies down the path to hosting hell. I despise them both – BH and their paid flacks. It is my litmus test on whether the blogger is on the up and up or whether he/she is a lying sack of offal. I’m bookmarking your site and sharing your review on my network. And I’m going to check out StudioPress. I already have their awesome Genesis framework so this will make it a clean sweep for them. …and thanks for your honesty. I am, right now, choosing a host for a new site and this is by far the most useful thing I have read. I had used Synthesis before and felt that it was fast. But it’s nice to have numbers to back up my impressions. There also are some other hosts here I hadn’t considered. The one thing that you could do to improve this article would be to include a chart or summary table. A graph would be really nice. You write that a graph would be nice. What kind of graph are you looking for? Let me know! Nice review, I’m on flywheel and love it, but basically found this article because I was having a debate with someone about performance and user experience. I have no intention of moving from their agency plan – 10 + My Site for £78 a month is an awesome price for the service and performance and works great for me. I do have to raise a bit of a bias in the article though. You used a Studiopress theme to test on Studiopress hosting. In my opinion this will have given an unfair advantage to Studiopress as they know how to optimise their themes for their servers. Really the theme should have been a popular but neutral option to make it truly unbiased. I do also have issues with Pingdom…. Gtmetrix and Webpagetest are both far more reliable for an accurate measurement of website performance and server response. That point has been raised before, and I checked up on it. StudioPress themes do not have an advantage on their hosting, compared to other themes. Genesis (and StudioPress themes in general) are among the most standard WordPress themes there are. If anything makes them special, it’s their “non-ordinaryness” – there’s nothing special about them. Using a Genesis/StudioPress theme in this test was to use a neutral theme. I could also have used one of the themes that come with WordPress, i.e. TwentySeventeen for example – the result would have been the same. I asked StudioPress about it, and they confirmed what I’ve written above. PS: thanks for your comments regarding Flywheel. Indeed they’re a good host! This, being the first time I’ve read your posts, was interesting and helpful. Though I wanted WPEngine ideally, I want to add another site and this is cost prohibitive for me. So..if I read you right pressable and flywheel seem to be ideal, no? When studiopress (pressable) mentions better support with their themes, what does he actually mean by that?? That appears to be the last question to be asked before moving to pressable when NOT using a genesis theme; NO? You seem to be mixing up Pressable and StudioPress Sites. They’re two different animals:) Pressable would be a good choice for you if WP Engine is cost-prohibitive for more than one site. Their pricing-structure does have a “hole” in that situation. So yeah: Pressable will likely be a good choice for you! Try them out and be sure to come back here to share your experiences with them! Great content – as always – and StudioPress got a impressive service. I’ve been using Flywheel for this client’ site (pinegrow.com.br) for almost one year, and I can’t ask for more: great performance, everyday backup, no down time at all and free migration from another hosting. 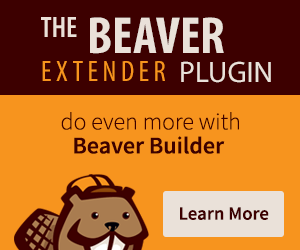 Last month they even notified me of a critical update for a plugin I use. The only thing it could be better is that are not using PHP 7 yet. Oops, Flywheel added PHP 7.1 just two weeks ago. Ah, and they made available for the wonderful Local, a free local WP development application (Mac/Windows). Thanks for sharing your experience with Flywheel, Cesar. Much appreciated! Good article. Would love to see WPX and Pressidium added to the list (both of whom I have have excellent experiences with). Also, assuming Flywheel hadn’t implement PHP 7 when the tests were run, I’d love to see them (and anyone else) tested again. I just wondering if you ever heard of SiteGround. You better check and compare with other hosts, it is a really great host! I will! Thanks for the suggestion. Just so much to do! Also, do you have any thoughts on WPX hosting? Nope, but have taken a look at them and may possibly test them too, in the nearby future when time permits. Thanks for mentioning them, Connor. Do you have any experiences with them that you can share? Makes sense, Connor. Thanks for sharing your experience! Do you think the fact that you used a StudioPress theme add to the fact that StudioPress hosting came out on top? I would think a StudioPress theme would perform better on StudioPress hosting than a non-StudioPress theme. Thanks for putting this together. Very helpful! All themes benefit equally from running on Studiopress Sites. Using a non-Genesis theme, your site will receive the same performance and security benefits (from a hosting perspective) that a Genesis-based site receives. Thank you so much for taking the time to test so much and to write such comprehensive reviews. I have used Bluehost for far too long, and feel duped by their promise that upgrading to their pro plan would offer site improvements (surprise: it didn’t). Plus there is far, far too much downtime. I’ve read plenty of reviews on managed WordPress hosting, but yours is by far the most thorough of them all! Thanks for the kind words, and in particular voicing your experience with Bluehost. It’s good to see my test results reflect real-world experiences like yours. Plus, I’ve only tried their Pro plan, so it’s interesting to read that you didn’t even see much difference between it and their standard hosting. Thanks for this comparison. I’m not surprised that Bluehost turned out to be a dud. Perhaps managed WordPress hosting is the only way to go these days. Especially with so many good options to consider. WordPress sites are powering more and more online business ventures, so the investment on costs makes sense now more than ever. Nice to see StudioPress Sites come out on top! I was a fan of Synthesis and now delighted to see StudioPress head in that direction. I’m just as curious to see what happens with Synthesis because of the move. Good thoughts. On one hand, there’s no reason Rainmaker Digital should kill Synthesis – yet on the other, they’ve ended some of their products every now and then. Premise and Scribe comes to mind, so I wouldn’t be surprised if they decide to keep Synthesis hosting running for existing clients and close it down for new signups. Thanks Oliver. I’m contemplating to move to Pressable from WPHostingSpot. Would you consider reviewing them as well as well as say, Kinsta, Pantheon and Pressidium. If there’s space, please include WebFaction and WPOven too. Good suggestions. I’ll keep Pressidium and Pantheon in mind for future updates. Kinsta is likely too costly for my target audience, though I have zero doubt they’re good (based on what I hear/read + some limited contact I’ve had with them). I’ll never review WebFaction, ever. They burned me several years ago, to the degree that I felt like Freddy Krueger afterwards. It’s not that I can’t forgive (I love letting go of old stuff) but the world is full of alternatives, so there’s no need to hope a bad experience won’t happen again, at a given host. WebFaction no more. Were horrible. I’m delighted you mentioned Pantheon as they weren’t in my mind at all. Seems like they’re evolving in a positive direction. They’re duly noted for a future update.